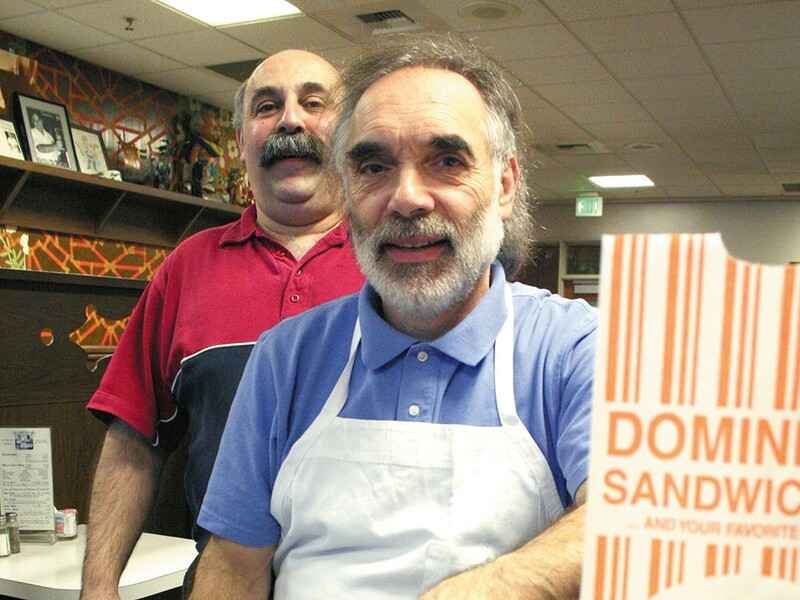 Joe Domini, with brother Tom in the background, is ending his career in the sandwich business. Regular guests of Domini’s will soon notice a vacancy at the longtime deli sandwich shop in downtown Spokane. Co-owner Joe Domini is retiring at the end of May. While his health is good and he feels great, Domini said he wants to pursue personal interests and spend more time with his family in Arizona. “I’ve already gotten rid of my snow shovels and sold my four-wheel-drive truck,” he says. His business partner and brother Tom will assume sole ownership when Joe steps down. Of the two brothers, Joe is the bearded one, usually at the cash register. He also is the older of the two by nine years. The soft-spoken Domini is retiring just after the restaurant celebrated its 50th anniversary. Founded in 1963, when sandwiches were priced at 50 cents, Domini’s moved to its present location on Sprague Avenue in 1975 and has been the top vote-getter 19 consecutive times for Best Sandwich in Spokane by Inlander readers. Domini is leaving with no regrets. The father of three daughters says he is happy to have been a part of the successful, family-run business and wouldn’t change a thing if he went back and did it all over again. He said large companies take a lot of risks making changes, which opens them up to failure. The only major change Domini’s has made is adding soup and offering a variety of sandwich sizes. The service is still quick, ingredients are piled high and most of the waitstaff know the regular customers by name. Just because he’s retired doesn’t mean Domini is going to sit back, put his feet up and become a couch potato. Domini attributes his good health to keeping busy. After he relocates to Arizona, where his two grandkids live, he plans to play tennis, continue riding bicycles and get back into playing golf. “I’m not a stay-home type of guy,” Domini says.